While the federal government contemplates military action against the regime in Syria for its alleged use of chemical weapons in the ongoing civil war there, a number of local residents are already mobilizing to take action. They’re honing the message, enlisting recruits, organizing campaigns and readying to march in preparation of a potential struggle, but not against Syria or any other adversary. Instead, their aim is peace. 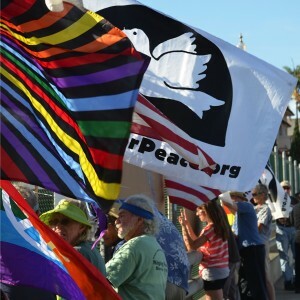 With the country winding down the longest war in its history in Afghanistan, Del Mar peace activist Martha Sullivan believes the conflict currently being proposed can be averted because people are fatigued with military action. 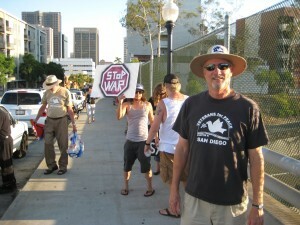 Sullivan has been involved with a number of local antiwar/peace organizations, such as the San Diego Coalition for Peace and Justice, and the Peace Resource Center of San Diego among others, for more than 10 years and is a founding member of Women Occupy San Diego. If peace activists take a dim view of just about every call to war, it’s because they take the long view of America’s involvement historically in conflicts far from home. When Gilbert Field, a Carmel Valley resident and past president of VFP, discusses claimed reasons for wars that eventually turn out to be false, he doesn’t just talk about the recent Iraq War but mentions Vietnam (during which he served in the Coast Guard) and others all the way back to the Spanish-American War. On the surface, it might seem counterintuitive to organize demonstrations, marches and vigils against war in a city so steeped in the military tradition like San Diego. However, Summers argues that support is garnered almost effortlessly from many of the 250,000 veterans in the county because those who have seen the tragic costs of war firsthand are usually the first to oppose it. While Field agrees with the assessment, he concedes that resistance to antiwar efforts is strong in San Diego because the multi-billion dollar armaments industry still has deep roots — and plenty of employees — here. Yet opposing war no longer consists exclusively of marching in peace demonstrations in the age of I-phones, Internet and instant communications, noted Sullivan. Multimedia platforms have opened up the opposition to multipronged actions. Promoting peace can become a full-time job, activists say, fraught with hardships, setbacks and open antagonism. Sometimes those difficulties can spillover into their private lives. Having seen some of the worst of it as a Navy hospital corpsman from 1973-77, Summers credits his colleagues and work at VFP with “saving (his) sanity.” With five children and several grandchildren, he finds his peace activism to be one of his most important services to the country and their future. The County of San Diego Veterans Services does not have an advocate in rural east county. When questioned they stated that they are stretched thin yet they have 13 locations with advocates. Some several times a month. Most of them on the coast. La Mesa is the only one close to east county. And that is a distance for anyone east of Alpine. Could they not come out to east county once or twice a month? Why do vets have to drive 80 miles or more round trip to see an advocate? Please join me in requesting Veterans Services to provide an advocate for the vets in east county.